This bright and colourful two-tiered birthday cake is dinotastic and features a cute, hand-crafted sugar dinosaur on top of the cake. It's a must for any children with a Jurassic appetite. 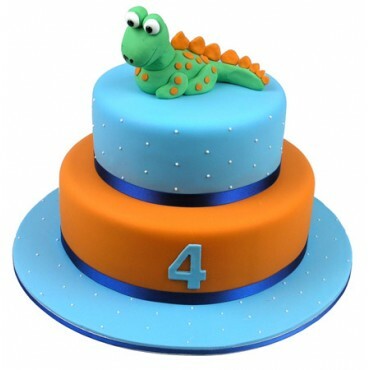 This two tier cake is dino-tastic and features a hand-crafted sugar dinosaur on top of the cake. The top tier is iced in blue and decorated with white, hand-piped dots. The bottom tier is iced in orange and has a blue sugar number 4 placed on the front. A royal blue satin ribbon surrounds the base of base tiers.